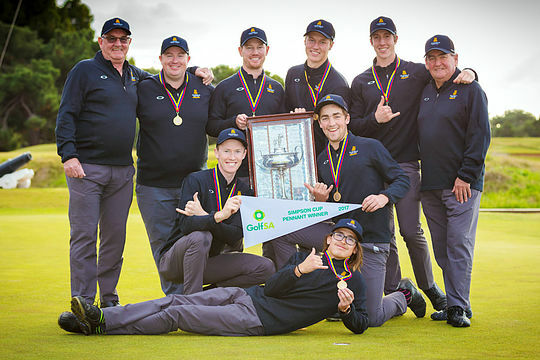 Glenelg Golf Club has won the 2017 Simpson Cup after defeating Kooyonga 5&2 in the South Australian Major Pennant final at Royal Adelaide. The contest was tight early with four matches square through seven holes in an evenly fought contest. By the turn Glenelg had edged to 4&3 lead ahead in matches one, two, three and with Ben Layton 3-up on Joel Durnford in the number five match. Kooyonga continued to put up a spirited challenge ahead in three matches and trailing only 1 down in two matches. As is often the situation in Pennant finals, the outcome can suddenly change and Glenelg quickly banked two matches, with Sam Burton at number three defeating Will Somerfield, 5&4, and Ben Layton closing out his match with Durnford 4&3. Kyle Hayter, secured Kooyonga’s first match, defeating Anthony Olsen 3&2. Hayter’s win was all the more impressive considering Olsen had been unbeaten in his past 22 matches. When Michael Munn secured Glenelg’s third match winning 1up in a hard fought contest against Tim Baker, Glenelg had the upper hand in the final and needed one more for the win. Kooyonga’s Daniel Speirs then defeated Josh Hayes, 2&1, to bring back the margin to 3-2 with two matches still in play. When Joe Hodgson made a huge up and down to keep his match going with Sam Earl with two holes to play, things were starting to tighten, but when Glenelg number one, Lachlan Barker nailed his approach to the par 5 second, to be on in two and Heath Riches went over the back for three, Glenelg were two putts away from victory. Riches made par, before Barker secured his birdie putt to win the Simpson Cup for Glenelg, the 11th time the cup has won the title. Glenelg Captain and Team of the Year Captain, Anthony Olsen, was delighted with how his team performed in the final. “A great result to back it up from last year, says a lot about the character of the boys, winning one is very different to having to back it up as favourites and being the hunted, so really proud of quite a young team this year,” said Olsen.